Which is the best advice for having productive conflict with a D style? - Share your feelings when it is appropriate to do so. - Take their emotional needs into account. - Don't focus so intently on your goal that they feel ignored or disrespected. - Use reason rather than force to make your points. - Don't push them for quick answers. - Be willing to compromise, even if you reach different logical conclusions. - Address issues quickly and directly. - Refrain from getting into a power struggle. - Be willing to compromise. The D style likes to cut to the chase and push strongly for their opinions. They like to tackling problems immediately and directly. During conflict, which style prioritizes harmony, stability, and reassurance? The S style seeks agreement, acceptance and peace. 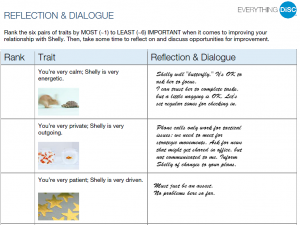 During conflict, which style prioritizes expression, assertion, and reassurance? Approval, understanding, and openness are the goals of the i style. In conflict, which style focuses on results and victory? The D style might overuse their need to win, impatience, or bluntness. During conflict, which style prioritizes objectivity, stability, and justification? The C-style is looking for fairness, rational decisions, and accuracy. In conflict, which style focuses on justice and logic? The C style might overuse analysis, restraint, and rigidness. In conflict, which style focuses on feelings and consensus? The S style might overuse passive resistance or compromise. Which is the best advice for engaging in productive conflict with an i style? - Resist the urge to give in merely for the sake of harmony. - Don't take their bluntness personally. - Address issues quickly and directly. - Look for the root cause of problems. - Focus on facts. - Give them space to consider their position. - Reassure them that your relationship is still intact. - Take a break if things get too heated. - Let them express their feelings. The i style might overuse passion and speak impulsively. They fear rejection and not being heard. During conflict, which style fears letting people down or facing aggression? The goals for the S style are agreement, acceptance, and peace. During conflict, which style fears being wrong and strong displays of emotion? The goals of this style are rational decisions, fairness, and accuracy. Which is the best advice for engaging in productive conflict with an S style? - Watch for signs of having offended them. - Encourage them to share their opinions. 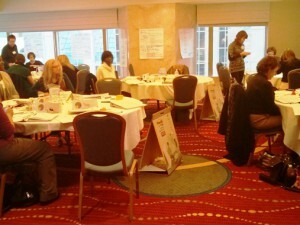 - Don't overpower them or dominate the discussion. - Take turns speaking and avoid talking over each other. - Refrain from getting into a power struggle. - Be willing to compromise. The S style is likely to make attempts to smooth things over during and after conflict. They may want to return things to normal ASAP. They are also likely to remain calm and be both understanding and forgiving. In conflict, which style focuses on expression and feelings? The i style might overuse passion, impulsivity and outspokenness. During conflict, which style prioritizes control, assertion, and justification? The goals for the D style are victory, results and personal accomplishment. Which is the best advice for engaging in productive conflict with a C style? 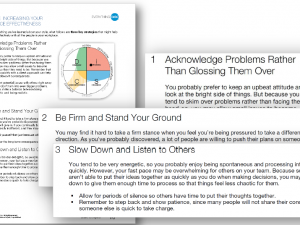 - Avoid an unnecessarily confrontational approach. -Give them time to reflect. - Don't gloss over tough issues. - Look for the root cause of problems. - Give them space to consider their position. - Keep volatility to a minimum. The C style is looking for fairness and accurate, rational decisions. They fear being wrong and strong displays of emotion. During conflict, which style fears rejection, not being heard, or dissapproval? The goals of the i style are approval, understanding, and openness. During conflict, which style fears being taken advantage of or appearing weak? The goals of the D style are victory, results, and personal accomplishment. 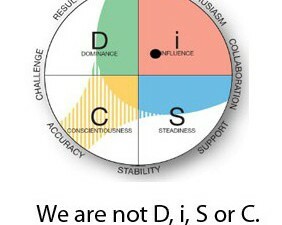 Need to review the Everything DiSC Productive Conflict profile. 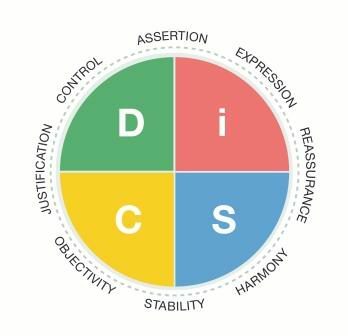 Learn more about your own style and how to engage in conflict more productively by taking the Everything DiSC® Productive Conflict assessment and reading the profile. You might also enjoy the slide deck Quotes about Conflict.